Beyond giving you the heebie-jeebies, carpenter ants are very destructive pests if they find a way into your home. You may have an infestation in your house if you notice a few big, blackish-red ants and sawdust looking powder on window sills or near floorboards. 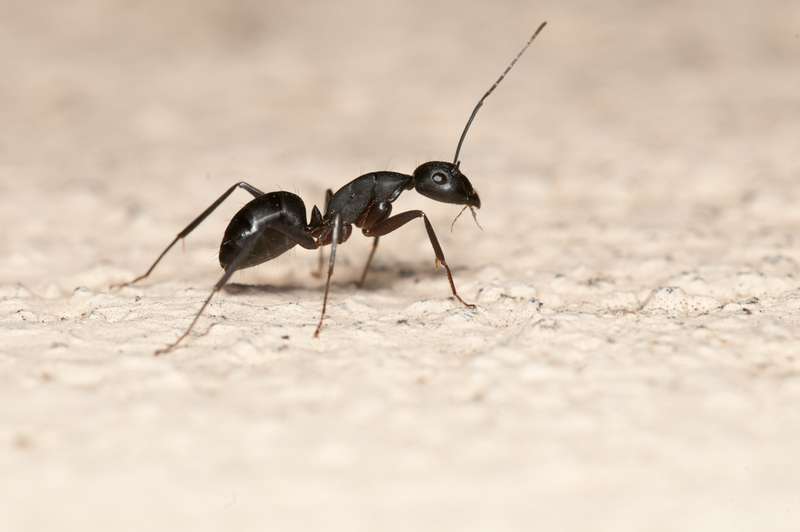 A major sign of these critters is the small rustling sound of carpenter ants in walls. If you think there’s an infestation in your house, here’s how to get rid of carpenter ants in walls. Carpenter ants range from ¼ to ¾ inches long, much larger than a typical ant. Carpenter ants may be black, brown, red or some combination of those colors. They have reddish-brown heads, a thorax and black abdomen. These ants are called carpenters because they like to nest in wall voids – they don’t eat wood. They look for the easy ‘chew’, targeting damp or damaged wood. Once they enter your house, however, they can create many more pathways or galleries. That rustling you heard? It can be the sound of carpenter ants gnawing a nest in your walls. Carpenter ants love sugar and protein, so once inside your home they’ll seek out pet food, meat snacks, jelly, sugar, and crumbs (especially sweet ones). When threatened, carpenter ants do bite, releasing a painful acid. Do not complete this step yourself. Rely on the expertise of a Portland exterminator who will assess the situation and respond with appropriate treatment. For outdoor nests, the exterminator may use a carpenter ant bait. The poisonous bait, placed along a foraging trail, will be taken back to the nest where it eradicates the colony. Insecticides are another option for outside nests. When sprayed around the perimeter of your house, insecticides will quickly stop outsiders from entering. When nests are found indoors, the exterminator will drill small holes 16” on center around the entire home, then spray an insecticide into the holes to kill the ants. Follow up exterior perimeter foundation stem wall treatments are advised during the warmer months. Check for leaks or damp wood since this can provide an easy point of access. Seal any holes or cracks on the exterior of your house around windows, doors, and utility lines. Trim trees and shrubs away from your house to remove ‘highways’ the carpenter ants may use to get inside for food. Consider investing in ongoing perimeter insecticide applications. This provides peace of mind that invaders will stay out. Call The Bug Man for more information about how to get rid of carpenter ants in walls. Our Portland pest control services are handled by professional exterminators who know how to get the job done right.